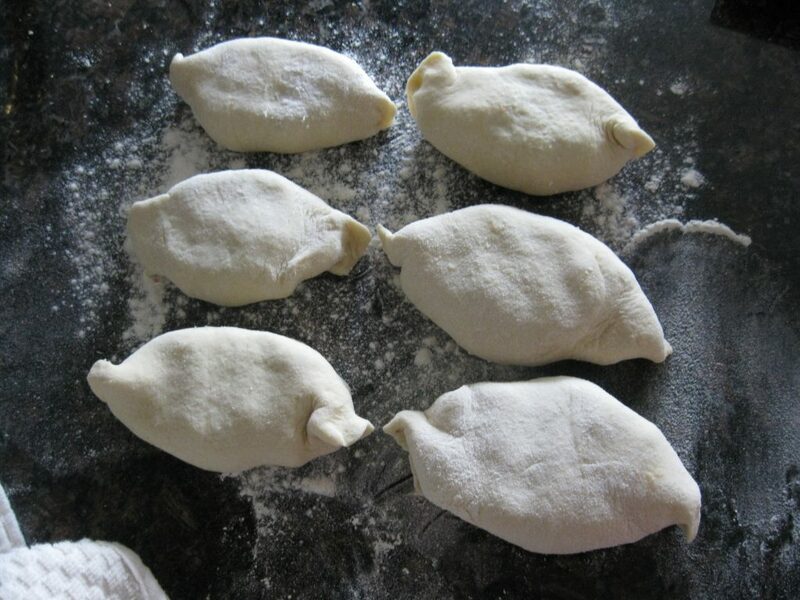 These pierogi are made from scratch. But most of the time I will buy a frozen white bread dough or White Dinner Rolls dough for this recipe. 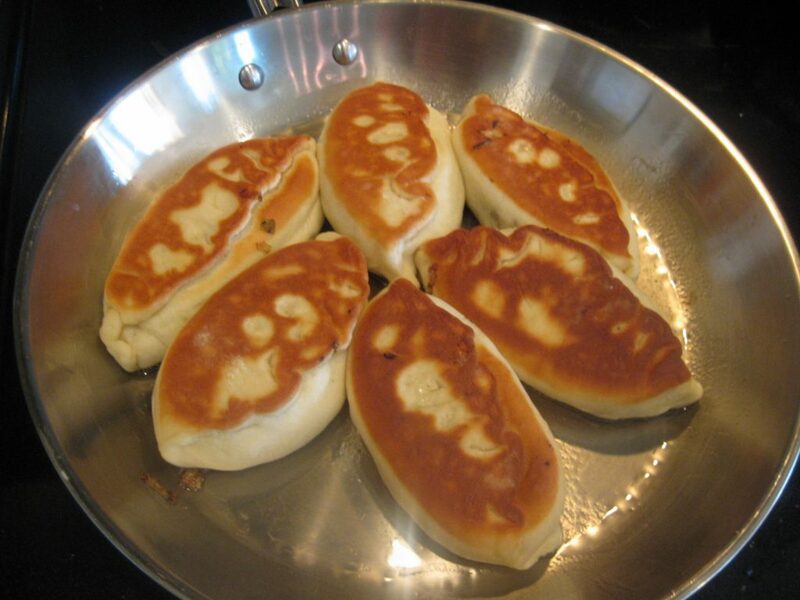 The refrigerated buttermilk biscuits from a Grocery store are also great for use as a dough for pierogi. 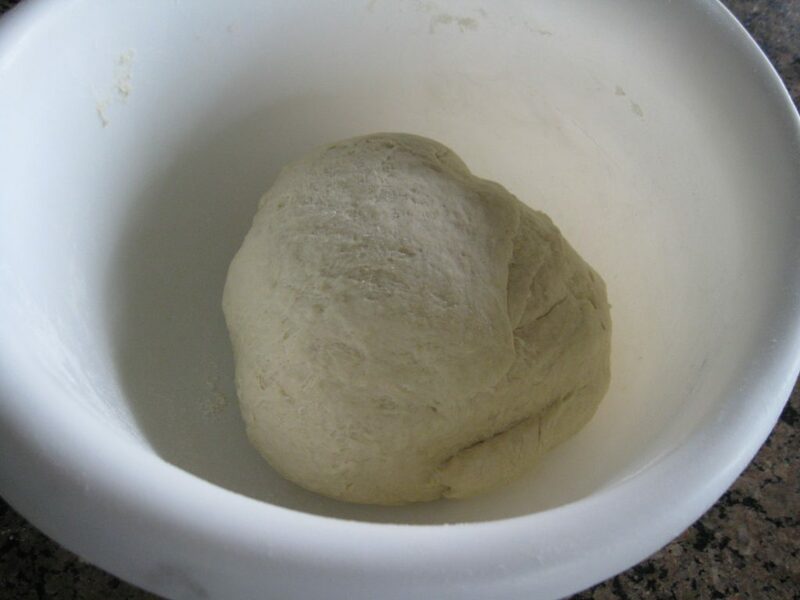 To make a dough from scratch, combine dry ingredients in a big bowl. 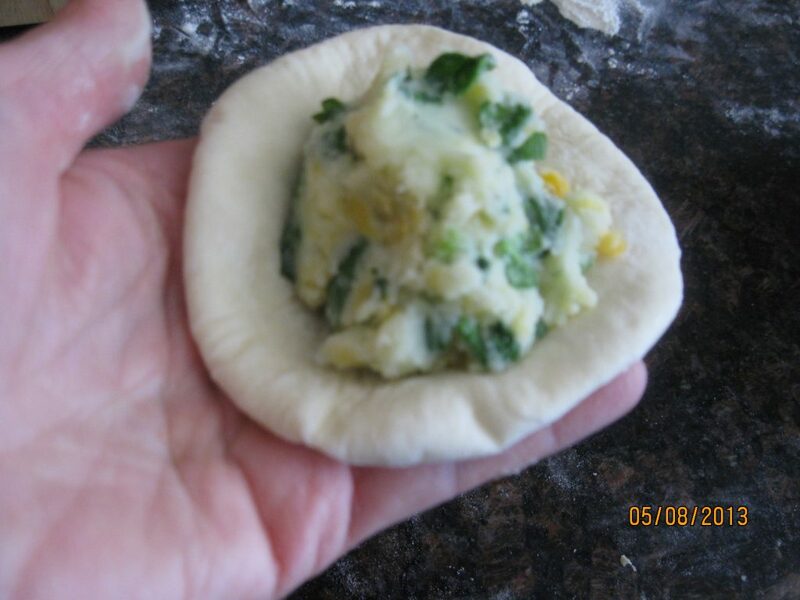 In a small bowl combine warm water, oil and butter, stir it and mix well together with dry ingredients, until the dough does not stick to your hands. 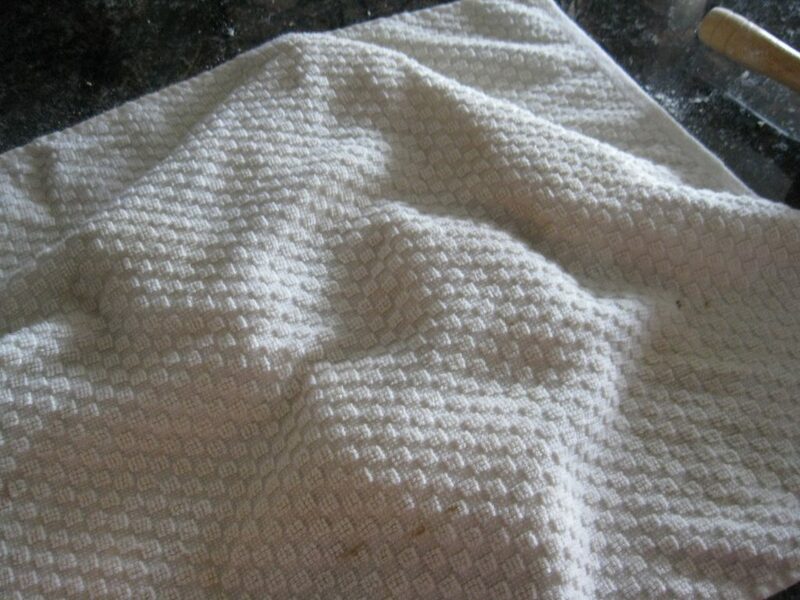 Form a ball, cover it with clean kitchen towel and put it in a warm place to rise, for about 1-1.5 hours until the dough rises and doubles in size. Drain the potato, discard the bay leaf. 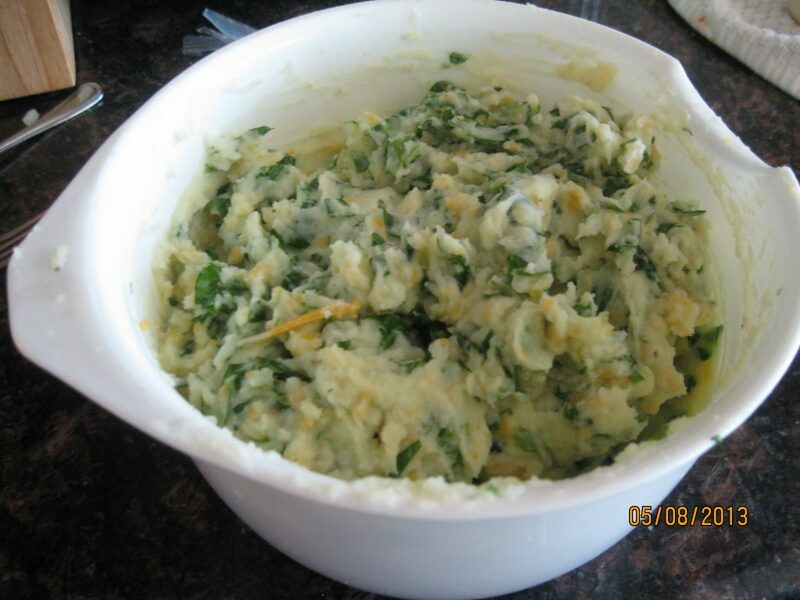 Mash the potato with butter to make a pure. Add cheese, spinach, dill, crushed garlic and pepper and mix them together well. When the dough doubles in size, it’s ready for the next step. 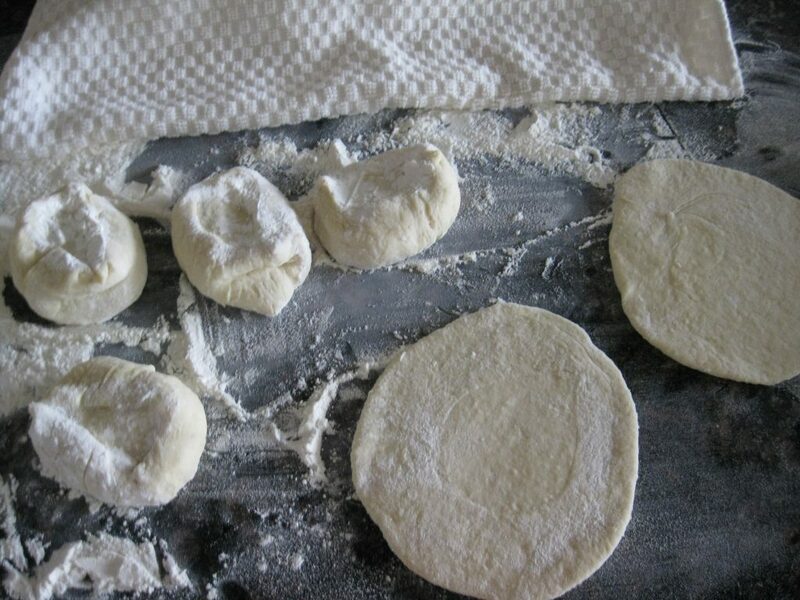 Carefully get the portion of the dough out of the bowl on the floured surface. Roll it in the form of the sausage-like shape, about 1-1.5 inch in diameter. Cut it into portion of 1 – 1.5 inch long cylinders, as it is on the picture above. The rest of the dough keep covered in the bowl. Deep both sides of cylinder in the flour so it does not stick to the surface, then roll each out in a circle of 3 1/2 to 4 inches in diameter. 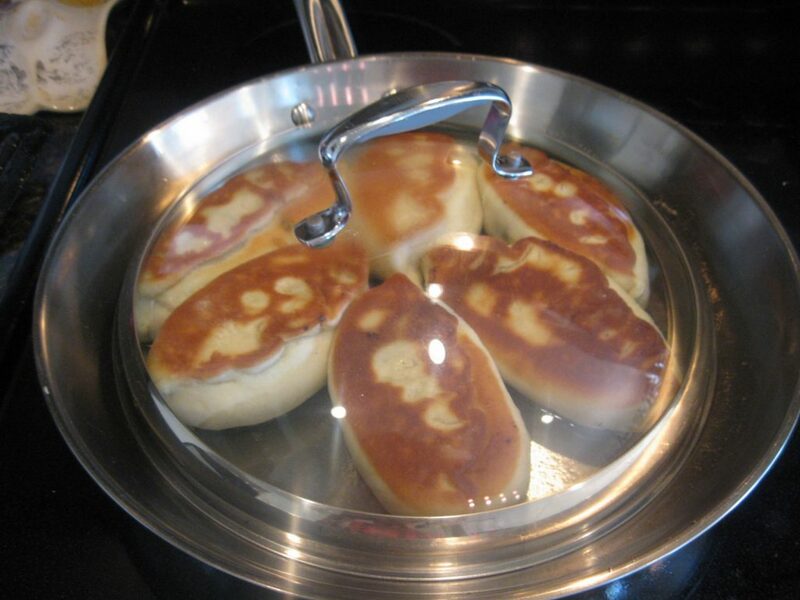 Put 1 full table spoon of potato filling to the center of each circle. 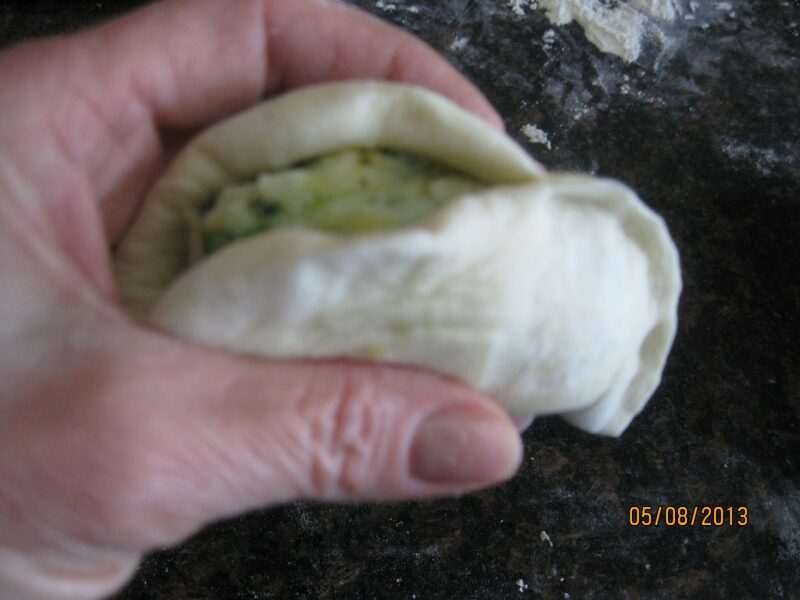 Fold in half and crimp the edges tightly. 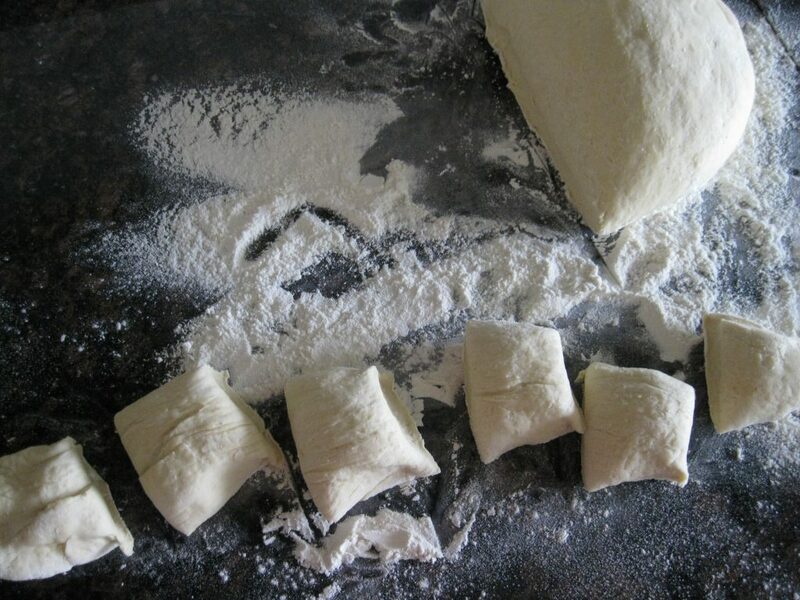 Place pirogie on the floured surface, the seam side down, leaving some space between them. 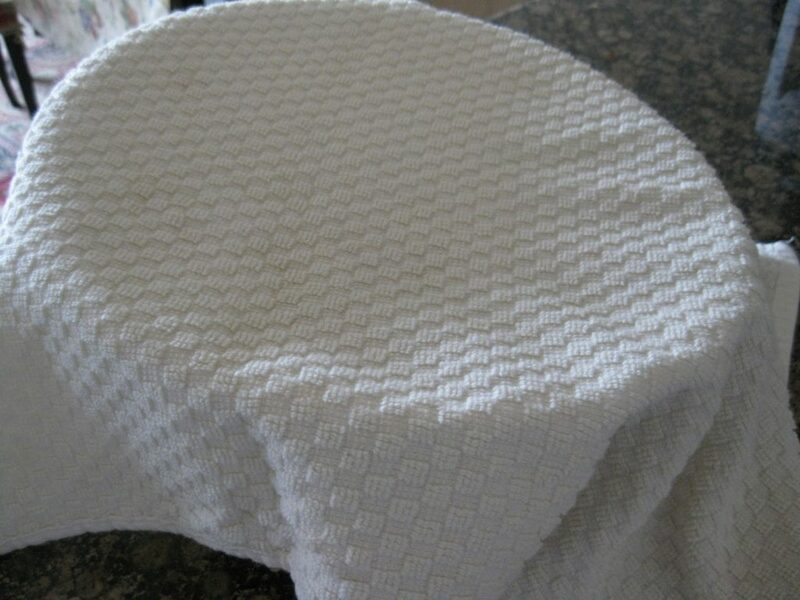 Cover with the clean kitchen towel and let them rest while we heat the skillet. Heat the frying pan to low-medium. Add 1/3 of a cup of olive oil. Let it sizzle. 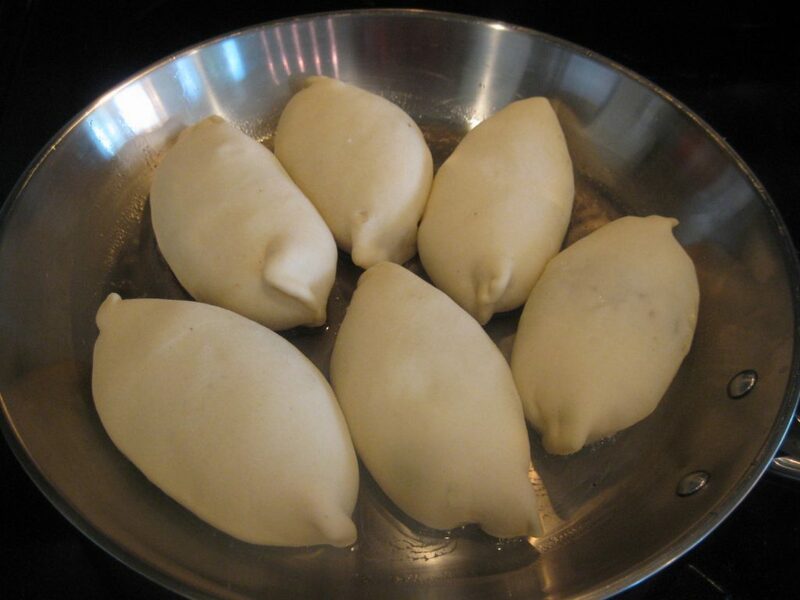 Put few pirogi in pan one by one, not very tight, as they still in process of rising . Cook on one side for 5 minutes or until the bottom is golden brown . cover with the lid and continue cooking for another 5 minutes. 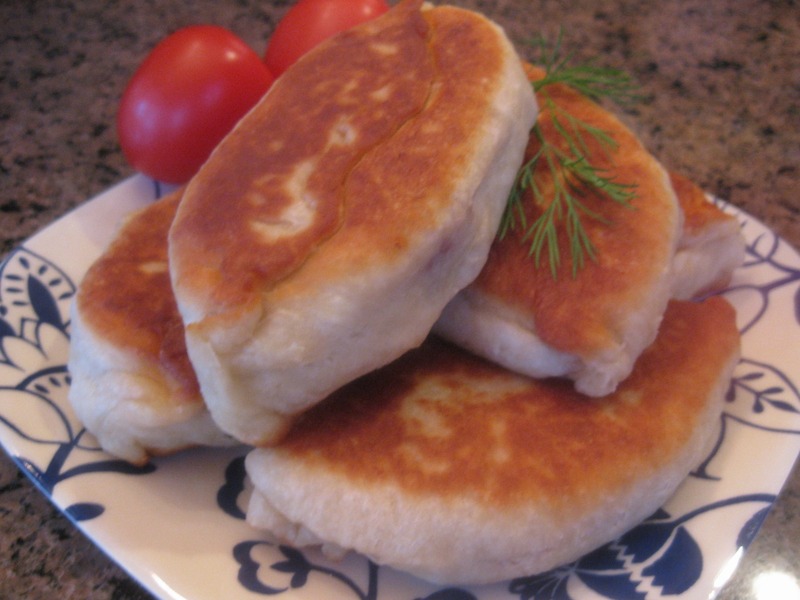 Serve pirogie for breakfast with a coffee or tea, with soup for lunch or green salad for diner.